We have 12 pair of them. Two of the pairs “float.” They are essential for breathing and the protection of our heart, lungs, and other vital organs. God took one from Adam to create Eve. Restaurants serve them: short, spare, baby back, and prime. And some condoms are accentuated by them. Oh, did I mention, chiropractors adjust them. What am I talking about? 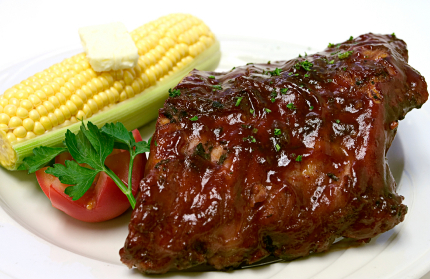 I’m not “ribbing” you, I’m talking about our ribs. It surprises a lot of patients when they find out that the sudden, sharp pain that stops them mid breath is attributed to a rib problem. That is, the rib has lost its normal mechanical movement. It’s scary, because the pain is usually very severe and can be felt in the back, side, and/or front — causing some patients to feel as if they are having a heart attack. And rightfully so, because heart attacks can feel like this — as can problems with other organs. But what if the problem is not coming from any of these remote areas? Unfortunately an undiagnosed mechanical rib problem can cause a lot of unnecessary worry — or even the thought that you are going crazy! I remember my mother’s story quite vividly. Her story is not unique, however, as I have other patients with ones that are similar — she’s just easier to pick on. My mom was plagued with a sudden onset of dull chest pain with weakness and shortness of breath. Not knowing what to do, she sought out her doctor — who equally did not know what to do and instructed her to go immediately to the nearby hospital emergency room. Several hours and a couple thousand dollars later in tests, she was informed by the emergency room doctor that there was “nothing wrong” with her. I saw my mother about one week later for Thanksgiving (she lives 1200 miles away). Still suffering from the chest pain, she told me her story. While no sudden trauma was involved, I found out with some questioning that, unbeknownst to her, one of a slow, gradually induced trauma was. Her work had just recently acquired a new computer system — which meant that she was stuck transferring data from her old computer to her new. Both computers were set up at her desk perpendicular to each other. Not wanting to constantly reposition her chair every time she had to change computers, she found herself twisting her upper body for prolonged periods over the course of about a month. Some other pertinent questions and a physical examination found that my mother had subluxated one of her ribs. The rib was extremely sensitive to palpation, inflamed, slightly displaced, and the surrounding muscles were in spasm. Knowing that I would not be with my mother for very long, and her reluctance to go to no other chiropractor but her son, I initiated some intense treatment over the next three days. Her pain level dropped significantly after the first rib adjustment and progressively got better with the subsequent ones. At the end of our time together, I armed her with rehabilitative exercises, icing instructions, and some knowledge on the importance of desk ergonomics. Mom was feeling 100% better and was greatly relieved to rid the notion that it was “all in her head.” Of course Mom left on a crusade to set the E.R. doctor straight. It certainly is easy to take our ribs for granted. We hardly think about them, but they are constantly on the move for us. Every time we breathe they move. When we move, they move. In fact, their constant movement serves as a sort of deterrent for degenerative joint disease — a principle that we chiropractors have always known about: joints that move, stay healthy. With ribs, we just don’t observe as much degenerative changes as we do in other areas. Not counting the odd ball floating ribs, a typical rib attaches to the spine (thoracic spine) and the breast bone (sternum) via four different articulations (costovertebral, costotransverse, costochondral, and sternochondral). The majority of our ribs move like a handle on a bucket, thrusting upward as we breathe and increasing the volume of the rib cage from front to back. 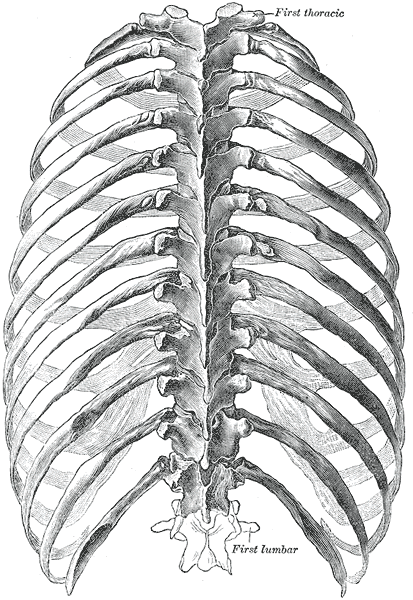 The other ribs, in the lower part of the cage, resemble the movement of calipers — increasing the volume of the chest from side to side with inspiration. With so much movement, the wrong kind of stresses can definitely create a problem. So what can cause a rib to go awry? Many things. Generally, there is a history of a sudden, unguarded movement. This may be from an explosive sneeze or cough, or may stem from a lift or overhead reach. A crushing blow to the chest can also be the culprit, such as those seen when a driver is thrown against the steering wheel in a motor vehicle accident. Carrying heavy weight on the shoulders or prolonged pulling and hauling can also put one at risk. The positional stresses and strains of certain sports (golf, tennis, baseball, triathlon, mountain biking, volleyball, football, soccer, rugby, etc.) can set one up for rib problems as well. And then of course, there is my mom’s case. Usually, a condition of muscular weakness and imbalance or structural irregularities, such as a scoliosis, will make one more vulnerable to these types of forces. The pain is usually felt, as stated above, in the back, side, and/or front of the rib cage, is described as sharp and stabbing (but can be dull) and is usually heightened by deep inspiration, coughing, and sneezing. It would be nice if it were always this easy to spot; however, with the complexities of our nervous system, this is not always the case. While not as common, some patients with rib dysfunction will have pains in other, more remote areas such as the low back, pelvis, abdomen, groin, or upper leg — something we doctors should tuck in the back of our minds when a patient is not responding to the treatment of the area we thought was the problem. Just to underscore the importance of our ribs, as I mentioned in the opening paragraph, the ribs are essential for breathing. Not only does their elasticity help to expel the air in our lungs when we breathe out, but the joints where the ribs moves on the vertebrae actually contain sensors that stimulate normal respiration. That’s right, we need our ribs to breathe! In one study, when these joints were anesthetized, respiration ceased. Which may explain, as one author pointed out, “why patients with sleep apnea [an involuntary and temporary stopping of breathing while asleep] respond to postural changes and corrective changes in the musculoskeletal holding elements of the thoracic spine and ribs.” There may be more to this rib thing than we give credit. Bergmann, Peterson, and Lawrence. Chiropractic Technique. Churchill Livingstone. New York. 1993. Gatterman. Chiropractic Management of Spine Related Disorders. William and Wilkins. Baltimore. 1990. Grice. Thoracic and Costovertebral Subluxation Syndromes. chapter 21 in Foundations of Chiropractic Subluxation by Gatterman. Mosby. St. Louis. 1995. Hearon. TMJ and Ribs. Advance Principles of Extremity Adjusting. (Lecture Notes). 1990. Innes. Chest Wall Syndromes. Dynamic Chiropractic. 12(13) 1994. This entry was posted on June 4, 2010 at 2:00 am and is filed under adjustment, chronic, extremities, mid back pain. You can subscribe via RSS 2.0 feed to this post's comments.